The intention of this project is to elevate the Ice Cream Person, a half-ice-cream, half-human hybrid, to the same legendary status as other cryptozoological icons, such as Bigfoot, or The Lochness Monster. By consolidating the evidence, stories, and artist-renditions into a cohesive database of frozen-facts, I am creating a foundation from which the existence of the Ice Cream People may be justified. 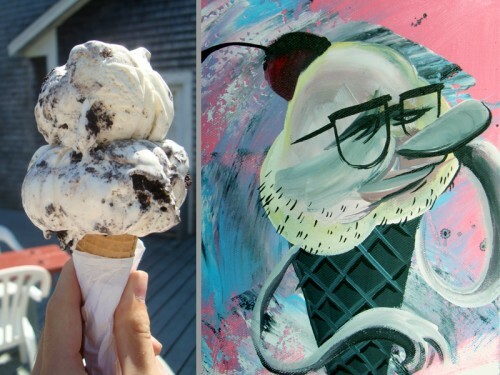 The only known footage of the half ice cream, half human hybrid. 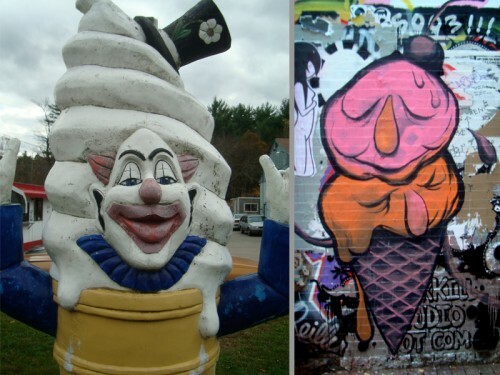 At first glance the images above may appear identical, however, upon closer inspection one might find the ice cream on the right to be slightly more alive. Bozo was one of the first Ice Cream People to enter my life. My encounter with him and his peer “The Douglas Ice Cream Lady Guy” led to the creation of this Ice Cream Adventure. On the right lives the Cambridge Gelato Man. He is often found lurking colorful alleyways. 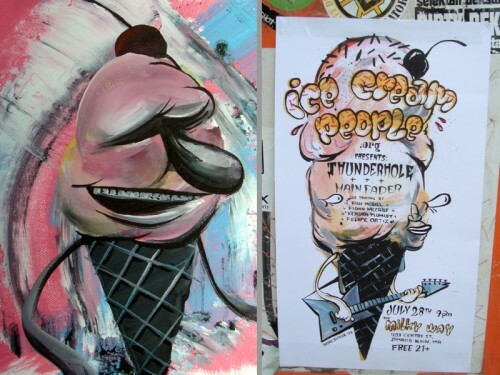 In July of 2008 the first Ice Cream People Rally took place at a venue outside Boston appropriately named The Milky Way. Here, people discussed individual encounters, bowled, browsed and contributed evidence. Live artist renditions were created by ice cream enthusiasts Fish McGill, Fionn McCabe, Kendra Plumley, and Felipe Ortiz. Event-goers were entertained by the musical trio Thunderhole, with ice cream tunes provided by Main Fader. Ice Cream People are not to be confused with Ice Cream Vendors, (folks who distribute ice cream to sweaty children in the summer via vans and carts). 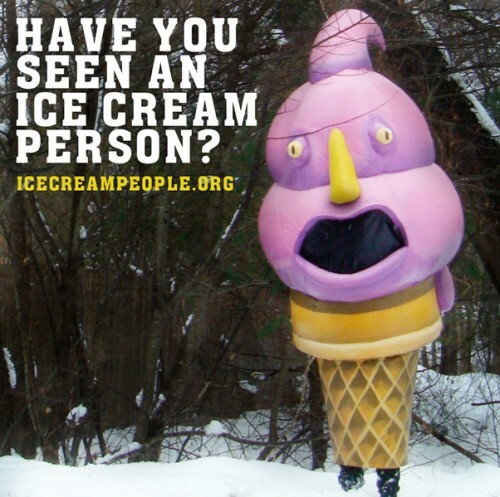 Ice Cream People can be identified by their part ice cream, part human characteristics. 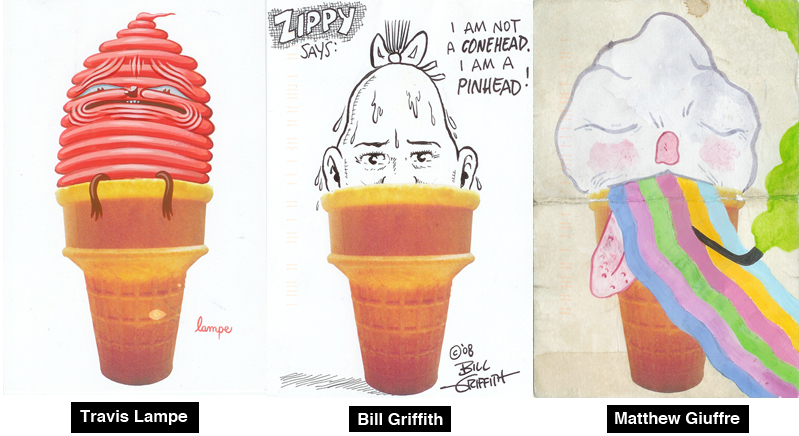 Common frozen features include a head made from frozen dairy product, ice bones, and a cone body to support the enormous head. To prevent further confusion, I developed the Ice Cream Person Template. It is a convenient vehicle for quickly illustrating the Ice Cream Person, in the event of an encounter. 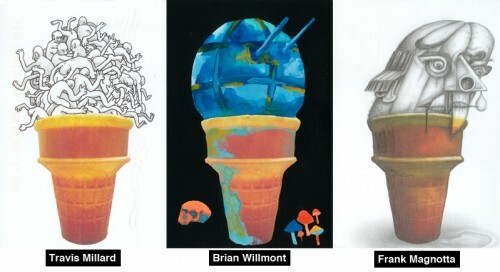 The illustrations above are some examples of the template in use. 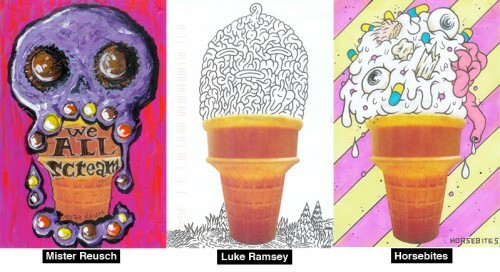 To view the entire gallery of artist renditions, click here.